Pop the game disc into your DVD player and let the movie magic begin! Timeless stars. Unforgettable moments. Classic lines and laughs. 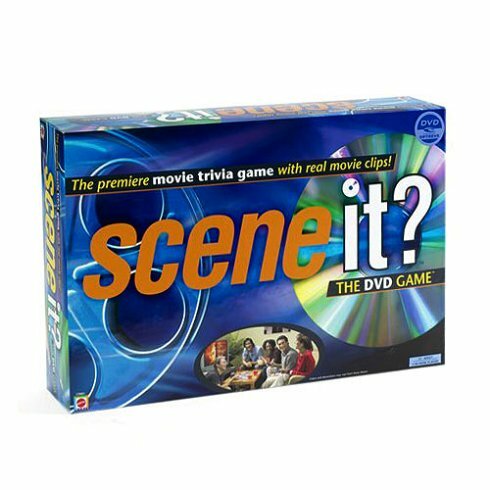 Enjoy them all in real movie clips from your favorite films as you answer trivia questions and race around the game board! Scene It? is more than movie trivia-use observation, memory, word play and puzzle solving to answer different challenges about what you see on-screen. Sure, you may remember who won the fight between Rocky an Apollo Creed, but what color were Rocky's trunks? Don't know? Don't worry! You'll see for yourself in the film clip! So if you think you're a "reel" fan, let Scene It? put your knowledge of the silver screen to the test! I'm not normally a fan of trivia games, but Scene it? manages to combine the different medias and really make use of the possiblities of the DVD - this makes it much more than just a typical trivia game. In fact, I can do reasonably well, even without in-depth knowledge of the movie scene. A great party game that can handle a lot of people at once.